Today I got a new Table (New to me) and I LOVE IT! I Found it on Craigslist and had to drive to Cottonwood to get it - but it was worth it. I think it looks great! Hey guys! It looks like life is treating you wonderfully! You deserve it! I love the table. And new is new. I am also so impressed that bryson reads so much and so well! What a stud! Nice table! Haha to me new is anything that I didn't have before. Even if its old to other people! It was great seeing you guys the other night! 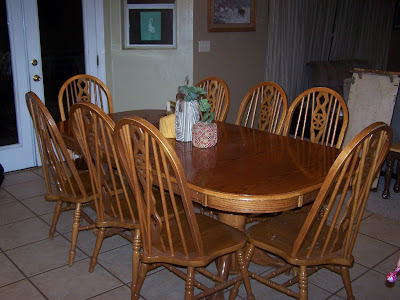 I want to get a new kitchen table too, ours is getting pretty tiny for our family! have you have Great taste!! It looks Exactly like mine! Cool huh! Congrats, I love new furniture.